Wow. That’s four black and white photos in a row. 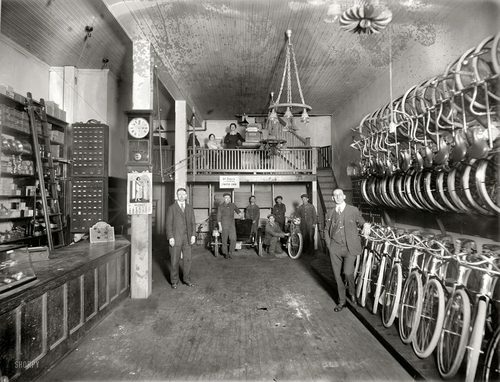 This photo was taken in 1919 at a bike shop located in Washington, DC. Around this time, there weren’t many, if any shops that sold motorcycles and bicycles due to the fact that prior to WWI, the motorcycle’s popularity was at an all-time high. During the war, the availability dwindled and again picked back up around 1919. In an era when two wheeled vehicles reigned supreme, one thing’s for sure, money talks. The sign in the back reads “All Repairs and Sundries, STRICTLY CASH”. Even in 1919, you were greeted with the same stink-eye many shops give you today! Thanks for the heads up Zach!